Oh my gosh– I made this cake weeks ago, but my heart still skips a beat looking at these pictures. It’s not from sugar shock, either…it’s from love…true love! Really, this cake will make you (and by “you” I mean me) forget that silly obsession with those achingly sweet iced chai latte thingies from Starbucks. I am so glad that The Cake Slice group voted to make this cake. I’ve had my eye on it since I got my copy of Sky High: Irresistible Triple Layer Cakes, and the only disappointing thing about it was that I only made half a recipe! The cake itself is made with chai tea-infused milk. The flavor is delicate, and reminded me more of a well-balanced spice cake than of tea. And the frosting…oh, the gloriously thick, honey-sweetened cream cheese frosting, dripping it’s way down the side of the cake. Does it get much better? Add a little Bollywood-inspired sparkle on top, and I think not. Look for a printable link to the recipe, courtesy of Gigi Cakes. Better yet, get your hands on a copy of Sky High: Irresistible Triple Layer Cakes by Alicia Huntsman and Peter Wynne. Don’t forget to cruise through the list of The Cake Slice Bakers— I guarantee that I’m not the only one who loved this cake! I missed out on. these. The layers are sky-high indeed. That is truly a work of beauty! It’s simple, yet elegant. Nice work! Wasn’t this a lovely cake? My husband just took the last piece of our second cake to work today. That frosting…soooo good. You do not know how happy I was that my cake turned out looking like someone elses! Without a picture I was crossing my fingers and hoping that my recipe interpretational skills would not fail me. I would like to ask what size pans you used for your “half recipe” cake. “Half recipe” is a new concept for me … but plan on using it in the future! debbmarie– If I want a round cake, I use 6-inch cake pans to halve recipes that call for 8- or 9-inch ones. I also reduced to only 1/2 the recipe… a BIG mistake. Your cake looks sooo delicious. I love the decorations! Okay, that does it. I’m ordering that book! Gorgeous pic! Your cake looks gorgeous. I’ve been reading all the love and praise about this cake. My defenses are weakening! 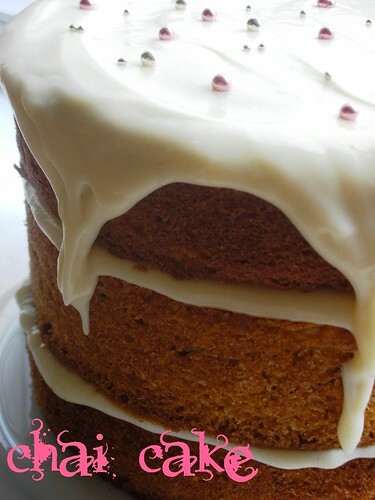 the dripping frosting.. lovely! I’ll be posting mine a little later though, so do come by! This cake sounds extremely good! If the hub knew I was making this cake, he’d be a bit hesitant to try it, but if I don’t tell him the actual name of the cake, I think he’d probably really love it…should I give it a try? This picture with the icing dripping down the side looks so tasty. Almost as if I could lick it off the screen. I’m never very inclined to use chai, for I’m not crazy of its taste, but if you say this one makes your heart skip a beath… then I might just give it yet, another try! It looks fabulous anyways! WOW! Yup, this cake is so good, something I’ll be making again. Love how tall your cake came out. This cake looks totally delicious. Just incredible! And, oh, that honey cream cheese frosting sounds out of this world. I really want to try this cake! After hearing you call it your “true love,” how could I not? Lovely cake. It really was good. I loved the frosting! Your cake looks picture perfect. It’s worthy of being used as an illustration for the book. Great job. 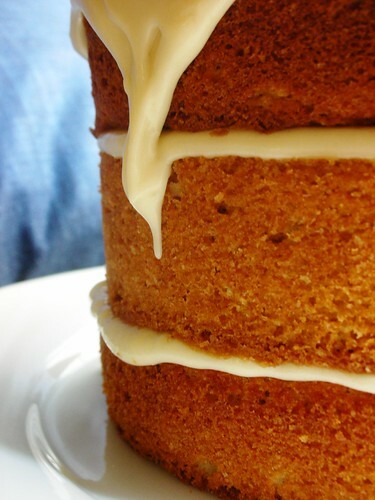 Your drippy frosting looks so lovely. Mine looked really hideous! It was a delicious cake, wasn’t it. And the frosting! Looks absolutely gorgeous and I love your “sky” high layers. Wow. Your cake looks amazing. Your passion for this cake jumps out of your post – wonderfully written! I love the look of the exposed cake layers. What a feast for the eyes Steph! Chai is my all time favorite spice and I so wanted to make this cake, but alas, it was not to be. Yours looks fantastic. So I will make in the future – real soon future. I think that close-up might be the most gorgeous picture of a layer cake that I’ve ever seen. I’m wicked impressed with both the baking and the photography. What beautiful pictures. I LOVED this cake. Yum, so glad I joined. Oh man, this cake is too amazing looking!